Isn't this patterned paper just Delicious?? 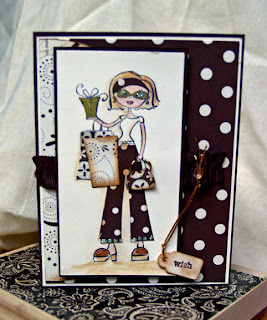 Featured in the Stampin' Up! Spring Mini Catalogue, Au Chocolat is a rich assortment of Chocolate and Vanilla Paper. Looks Good enough to eat!!!! I created both cards using some of the designer paper. 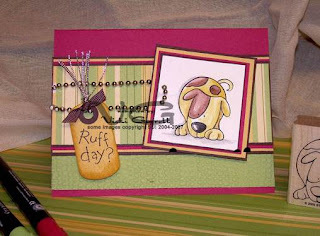 This Paper will work with Cute and Whimsical as well as elegant styles of Cardmaking. To make the Doodle Card, I stamped the large flower on Chocolate Chip Cardstock and embossed with Gold EP. I then cut it out and mounted it on the embossed background with a large dimensional. The scalloped edges were rimmed and embossed in Gold Glory. Papers inked to the edges with Chocolate Chip Kraft Ink. I stamped the Sentiment on the layered Tag Punches before running it through the embossing template. For the Chocolate Chickie, I stamped the image on the backside of the designer paper and cut out each peice, layering onto an image that I had previosly stamped and colour onto vanilla cardstock. I used a metallic gel pen to highlight the glasses and presents and stickles to the bottom of the pants and the middle of the sunglasses for some ZIP! No Stamping involved in this card!!! Do you have a tendency to save a bunch of paper scraps and never use them? When Scrapbooking, I try to make a card or two with the excess paper because I find if it goes into the "little envelope" it is unlikely to see the light of day again!!!!! 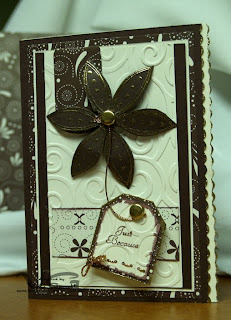 This card was made using We R Memory Keepers Boho Chic Patterned Paper and Stampin' Up! Cardstock. Suitable for a nice "springy" day, such as we are enjoying here today! I created this little card for a SCS colour Challenge. Isn't the striped paper delicious? It is from the Petals and Paisley Patterned paper from the Spring Mini Catalogue! There is a GREAT special for The Petals and Paisley bundle in March. Email me at vickig@kos.net for details! 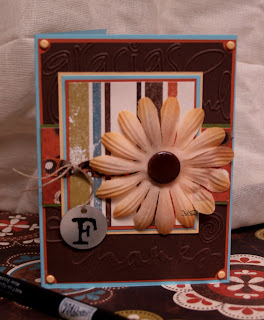 I promised to fill you in on my stamping weekend with my best stampin' chicks. I was able to catch an early train last Friday, to Woodstock. Unfortunately a CN Train had derailed on Wednesday night, so I got the benefit of Bussing to Woodstock from Oshawa. Arriving only an hour and a half behind left lots of time to stamp with Jacqui on Friday night. Saturday Kim, Jen, Tammy and Sarah joined us for a Shoebox Swap and we spent the day chatting, snacking and stamping of course. I just wish I lived closer, but really cherish the times when we get together. Her Gallery is under sisterlines. I am lucky to have her in my life. She is like a sister to me! This was a Really Fun card to create!!!! 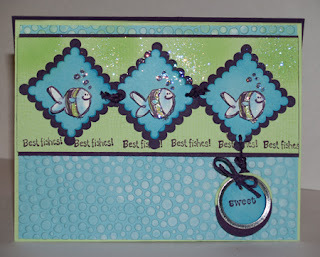 I used my new cuttlebug embossing template and went direct to paper with a white craft inkpad to create the "foamy" bubbles. 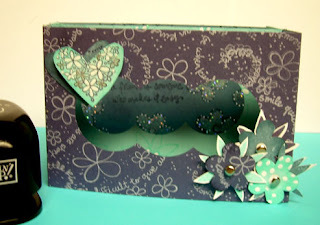 The cute layered scallops are dies cuts by cuttlebug, the tag was made with cool caribbean paper and the MM tagmaker kit. All images Copyright SU! 2005-2007. I had the opportunity to spend an AMAZING weekend stamping with my Girlfriends!!! Stay tuned, I will post the great projects within the next couple of days!!!! !